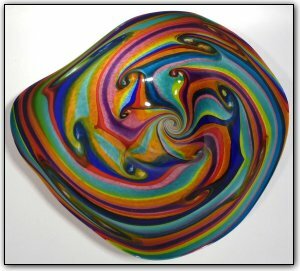 This bright wallbowl features a rainbow of vivid blues, purples, oranges, reds, pinks, greens, yellows, and more. To help the colors stand out and to make them even more vivacious, a special technique was used where a thin layer of white is applied beneath the thick layer of color, making the colors so bright and vivid that they just about jump off the glass. Make sure to zoom in to see just how deep and luscious the colors are, and the way they interact with each other in such beautiful and unique patterns. Wall bowls can be hung on a wall just like a picture or they can also be set out as a table bowl as well. To hang the bowl on a wall, all you need is a secure hook on the wall and a hanging apparatus comes along with the bowl. Hanging the bowl is a breeze and should take less than 10 minutes. You won't believe the compliments you are sure to receive when displaying this absolutely gorgeous bright rainbow wall bowl!